What enticed me to buy this wine was not the fact that it was organic/biodynamic but just the simple fact that is was a Frizzante Rose. I very much enjoy Rose and thought that a bit of effervescence in it would also be quite enjoyable. I have had other Rose Sparkling Wines, but they have usually had the usual level of carbonation like a Champagne. Sometimes I want a bit less carbonation, though more than a still wine. The 2007 Weingut Michlits Frizzante Blanc de Pinot Noir (about $17) is made in the Burgenland region of Austria. The winery itself is located on the east side of Lake Neusiedl, next to the edge of the Hungarian lowland plains. The winery is organic and certified biodynamic. Their website has details about their biodynamic philosophy. They also raise Angus cattle on their property. The wine only has an alcohol content of 11%. It also has a vibrant pink color and the bottle contains a more unsual cork. There was string tied around the cork, which stuck out a short bit out of the bottle. It almost resembled a Champagne cork except it was much smaller. You could not twist off this cork. It needed a corkscrew. When I opened it, there was a quick rush of bubbles but they soon dissipated. The wine has more of a floral scent with a tinge of strawberry. But on the palate, the fruit flavors took over, ripe strawberry and raspberry. It was a dry wine with just that hint of effervescence, making it very refreshing. I very much enjoyed this wine, and it would make a good apertif or a summer sipper. My new column of "A Passionate Foodie" can be found in the July 30 issue issue of the Stoneham Sun newspaper. This is a weekly column that concentrates on reviews of local restaurants though it may also touch on a few other food and wine topics. The new column has been published today and will soon be available online. The new column discusses a foodie trek through Boston's South End. I provide numerous recommendations for bakeries, markets, restaurants and wine shops in the South End. Plus, you will be sure to find many places on your own too. Bacon seems to enhance so many dishes. Just give me a crisp, salty slice of bacon and I am very happy. Breakfast, lunch, dinner or as a snack. But what about dessert? I am certainly willing to give it a try so when I saw a chocolate bar with bacon at a local store, I just had to buy it. Vosges Haut-Chocolat is owned by Katrina Markoff, who received her training at Le Cordon Bleu in Paris. She creates very exotic blends with chocolate, spices, flowers and much more. This is a small sample of some of her unique creations. Her mission statement: "The Vosges Haut-Chocolat mission is to create a luxury chocolate experience rooted in a sensory journey of bringing about awareness to indigenous cultures through the exploration of spices, herbs, roots, flowers, fruits, nuts, chocolate and the obscure. We invite you to be aware and open to the many cultures, artists and theories of the world's people, through the medium of chocolate. What better way to learn about a culture, person or object than through eating. If we can embrace the idea of trying something new such as the perplexing oddity of curry and chocolate, we just may come one step closer to bringing peace to the world through chocolate. One Love, One Chocolate." I have tried some of her chocolate bars before and enjoyed them, especially the intriguing blend of flavors. But I had yet to try Mo's Bacon Bar ($7.50) which contains Applewood smoked bacon, Alder wood smoked salt and deep milk chocolate. The bar weighs three ounces and has 41% cacao. The wrapper suggests that you begin by rubbing your thumb on the chocolate, releasing the bacon aromas. I tried that and the smell was unmistakably a smoky bacon combined with the sweet aroma of chocolate. It certainly appealed to me and I quickly bit into the bar, letting a piece of the chocolate sit in my mouth. As it melted, my tongue sliding over it, there was a distinct bacon flavor. In fact, there were tiny pieces of bacon inside of the chocolate. The salty bacon was a fine complement to the milky chocolate. Though you might not think bacon and chocolate can work, the saltiness of the bacon certainly enhances the chocolate. I was in heaven. The chocolate bar lasted only two days. And it was difficult to even do that. I thoroughly enjoyed the bacon bar and I will buy more the next time I see them at the store. It also makes me think of other desserts where bacon might fit. A hot fudge sundae? Brownies? Tiramisu? Mmmm...it will be fun to experiment. The Ginger Pad recently increased the size of their restaurant, adding more of a sit-down area with an expanded menu of offerings. I previously dined there on their opening day with somewhat of a mixed review. I returned again for lunch to see how things are progressing. First, I should note that initially the sit-down restaurant had a completely different menu from the stir-fry area. But, due to customer requests, they have begun offering a few items from the stir-fry menu in the sit-down dining room. In time, they may combine both menus into a single menu. This is good as it shows they are listening to their customers and are willing to make changes. I began with the Ebi Shumai ($7), six steamed shrimp dumplings with a dipping sauce. They were very good shumai, cooked well but not overly done. The price is reasonable considering many places give you four shumai for around $5. For my entree, I chose the Asian Short Ribs ($16) off the dinner menu. This comes with a choice of salad or soup, and your choice of white or brown rice. I chose the miso soup and enjoyed it as much as much previous visit. The Short Ribs are cooked with a ginger and honey glaze. When they arrived, there were six good-sized ribs in the plate, slathered in sauce. I will warn you that this is a messy meal so ask for extra napkins. They will also bring you a warm, wet towel and lemon slices for after the meal so you can clean your hands. The ribs were very meaty and tender, easily coming off the bone. And I very much enjoyed the sauce, a bit sweet but not overly so with some interesting spice flavors. This dish impressed me and I would definitely order it again. My server was very good, attentive and personable. Overall, this was a good experience and it appears the restaurant is trying to improve. You should check them out. While persuing the new, special issue of Wine & Spirits magazine, titled "Rebels Rock The Best In The World of Wine," I found an article on "Best Rediscoved Varieties" The article describes a number of grapes that have moved out of obscurity and into a more prominent place in the wine world. One of these grapes was Aglianico from Italy. This was especially interesting as I had tasted an Aglianico wine the evening before. There is some dispute over the origin of Aglianico. Many seem to believe it is on Greek origin, its name derived from the words "hellenico" or "ellenico" which mean "Greek." The grape was known by these names until the end of the 15th century when it became "Aglianico." There is also speculation that it was a grape native to the Campania region of Italy and the Greeks were the first to domesticate the vine. Aglianico is a thick skinned grape with a deep color. It usually sprouts late, thus avoiding frosts, and if it is harvested prematurely may lead to a strongly tannic wine. Aglianico seems to grow very well in volcanic soils. It has become a major grape in Italy and is sometimes called the "Barolo of the South." The 2004 Antica Hirpinia Aglianico Irpinia IGT (about $15) comes from the Campania region of Italy. The Irpinia IGT covers an area where the Taurasi and Greco di Tufo DOCGs are located and Taurasi is considered one of the best areas for Aglianico. (Please note that the Antica Hirpania website is only in Italian.) This is their entry level Aglianico, an inexpensive wine that will provide an introduction to this grape. As the wine only has an alcohol content of 12.5%, it is also something you can have a couple glasses of and not feel light-headed. With Aglianico, it is said that mountain grown grapes have stronger tannins, and thus age better, while lowland grapes are rounder and more forward. Though I do not know where the grapes for this wine were grown, I suspect they might be more mountain grown. The wine is a very dark red in color, nearly purple. On the nose of this wine, I get more of a dried cherry and leather smell. Initially on the palate, it is a bit austere with strong tannins, thus bringing to mind mountain grown Aglianico. There is also some high acidity there too. In addition, it has more dried fruit and ripe plum flavors. It is clearly a wine intended for food, a more traditional Old World wine instead of the more international, fruit forward wines. I paired the wine with a simple pasta and meatball in a marinara sauce. It is with the food that the wine really came to life. The tannins smoothed out with the food and more of the fruit flavors of the wine came out. I enjoyed it very much with the food. This is a wine you might have at a tasting and initially not like, but if you had it with food you would change your mind. That is something common to many more traditional Italian wines, as well as many other European wines. Wine for them was long an adjunct to food, not a stand alone beverage. At this price point, the wine is a good value and I would recommend it. It would be interesting as well to taste their higher end wines, to see the true potential of the Aglianico. In keeping with the trend towards eating lighter, spending less, and enjoying more choices at the table, Master French Chef Raymond Ost of Sandrine's Bistro in Harvard Square this week debuts a Bistro Menu that offers the same creative French cuisine, but in smaller portions, and at price points that encourage the sharing of multiple items. Virtually all of the starters at Sandrine’s Bistro are priced under $20, so diners may combine dishes from the regular and Bistro menus. Add a bacon-onion flammekeuche (Alsatian flatbread pizza) to the meal for $12. Add shrimp brochette over chilled lemony couscous for $14. Add a generous apple-Roquefort-cashew salad in port wine vinaigrette for $14. As I recently mentioned, Bin 26 Enoteca has been on my short list of restaurants to try, so when I spent some time on Charles Street over the weekend I had to stop by for lunch. Bin 26 Enoteca has a seasonally driven menu and an extensive wine list with over sixty wines by glass. The menu is designed for snacking and sharing, or a full meal. The restaurant is owned by the brother and sister team of Chef Azita Bina-Seibel and Babak Bina, who also owned the acclaimed restaurant Lala Rokh. The restaurant has an interesting look, a hip and modern look emphasizing a wine decor. It is a casual and comfortable place, looking out onto Charles Street. They have an extensive and interesting wine list, with many different wines from all over the world. They do not sell wines by the glass in a traditional way. Instead, wine is sold in 100ml, 250ml, or 500ml potions. A normal 5 ounce glass of wine is 150ml. So, you can get less than a usual glass, more of a tasting size. Or you can get a larger glass, about eight ounces, in the 250ml measure. If you just don't want an entire bottle, then get the 500ml size. This might get confusing for some people who are not used to such measurements. I like the 250ml size, especially if I am going to get a single glass with a meal. We had a couple glasses of Rose, a Swiss Gamay and a French Provence Grenache/Syrah blend(about $13/$14 for 250ml). Both were very good though I preferred the French Rose. It had a nice strawberry taste without being sweet. The lunch menu had appetizers, salads and entrees, a smaller selection than what is available for dinner. We decided to split several dishes between the three of us. There was Salmon atop a salad with a warm bacon vinaigrette, Goat Cheese three ways, Prosuitto, garlic and tomato confites, and Linguini with a Beef Bologonese. Prior to our food arriving, we received a basket of fresh bread, two different types, with a plate of olive oil. The olive oil was plain and very good, though it might have been more interesting with some spices in it. The Salmon, a good-sized piece, was delicious with an interesting bacon flavor. The salmon was very fresh as were the salad greens. In fact, all of our dishes seemed to have very fresh ingredients. The Prosciutto was very good as were the three different goat cheeses. The goat cheeses were very creamy and flavorful, especially smeared atop the slices of bread. The Linguini seemed to be homemade and was cooked just perfectly. And the Bolognese sauce was absolutely delicious with plenty of meat. I almost could have licked that plate clean. Service was excellent. The servers were attentive, personable and accomodating. Overall, the restaurant made a good first impression on me. The flavors and freshness of their ingredients were quite appealing. I will definitely return here again, especially to try their more extensive dinner menu. It is well worth a visit. On a sunny Saturday afternoon, while walking down Newbury Street, there are plenty of restaurants with patios where you can dine outside and people watch. This weekend, I stopped by Tapeo for a few tapas and some sangria. Tapeo is the sister restaurant to Dali, one of my favorite restaurants. Their menus area nearly the same though the ambiance is very different. I have eaten inside of Tapeo before and it lacks the romantic ambiance of Dali as well as the sense that you have traveled elsewhere. But, Dali does not have an outside patio, which is its own ambiance. When I do stop by Tapeo, it is generally to dine on the patio. On this visit, there were three of us and we ordered a pitcher of Sangria ($26) as well a Tortilla Espanola ($7), Gambas al Ajillo ($9.50), and Patatas Bravas ($6.50). The first thing to reach our table was the Tortilla Espanola. Where was the Sangria? Where was the bread and chickpea spread? At Dali, the bread and Sangria are the first items delivered to your table. The Gambas then came and still no Sangria or bread. The bread finally came but the Sangria did not arrive until the Patatas did. The service did not please me. I will note that the service has usually been better on my previous visits. The Tortilla and Gambas were very good. The Tortilla is a large slice of an egg, potato and onion omelette. The Gambas was a small terra cotta dish jammed with sizzling shrimp and garlic, one of my favorite tapa. I enjoy putting the thin slices of garlic, with some oil, atop the bread. The bread was not up to its usual quality and even the chickpea paste was not as good as usual. the Patatas were another disappointment. They usually have a crispy exterior but these lacked that crisperior exterior. The Sangria was up to its usual high standards. It was certainly pleasant to sit outside, sipping Sangria, on such a nice day. But the meal itself was somewhat of a let down. Tapeo can and has been better. I hope this was an aberration and not the norm of how it has become. Dali remains a much better choice. The JoongAng Daily reports that Korea is suddenly becoming a significant market for Japanese Saké. In the last six months, Saké imports have risen 46.1% from the same period a year ago. Within these last six months, Korea imported 752 tons of Saké, valued at about $2.59M. It should be noted that the value of the imports has risen 73.8%, which seems to imply that more expensive Sakés are now being imported into Korea. One reason appears to be the increased popularity of Japanese restaurants in Korea. It may be too early to know whether this is a temporary fad or whether Saké will become a more permanent fixture in Korea. As I have discussed before, the number of Saké breweries in Japan has been declining. Many breweries are looking to outside markets to sell their Saké and the U.S. has become a significant importer. It would benefit Japan if other countries, like Korea, also become significant importers. Japan should engage in a larger marketing campaign to find new markets, to show the rest of the world the wonders of Saké. In the morning, you can find plenty of places in the North End for a coffee and muffin or pastry. But, if you want a more substantial breakfast, your options are more limited. We chose to get some breakfast at Cafe Pompei as it was one of the few places advertising a fuller breakfast. Their Specials sign outside advertised French toast, Crepes, Omelettes and more. I had never been here before so I was taking a chance. It is a fairly good-sized place with two separate dining rooms and it appears there is a basement level as well. One thing that turned me off a bit was that the walls were dirty and stained. They obviously had not been cleaned in some time, though the tables and silverware seemed clean. The breakfast menu had all of the usual items and they were very reasonably priced. We decided to try several different items, including the French Toast, Waffle, Bacon, Strawberry Crepe and Blueberry Pancakes. The best of the meals was the Strawberry Crepe, a very thin crepe with plenty of fresh, sweet strawberries and a few piles of fresh whipped cream. This was on of their Specials and I would definitely recommend it. The Pancakes were another good choice, with plenty of blueberries in the pancakes. The French Toast consisted of pieces of a baguette on a plate with sliced strawberries and blueberries. The toast had a very nice flavor and the fruit was very fresh and sweet, as was all of the fruit that came with out meals. The Waffle, shaped with Mickey Mouses's head, was ok though nothing special. The bacon was crisp, just the way I like it though strangely enough it came out in a small bowl rather than on a plate. Overall, it was a good breakfast. Service was also good. When you visit a famed restaurant like Le Bernardin, a restaurant with three Michelin stars and four stars from the New York Times, you expect a stellar experience. Its vaunted reputation creates high expectations. I had never been to Le Bernardin before, but I had read much about it. When I made my reservations, I hoped that it would live up to its reputation. The restaurant was founded by Maguy La Coze and her brother Gilbert back in 1986. Both born in France, they opened a Le Bernardin in France in 1972. They got the name from an order of monks. Eventually they decided to open a second restaurant in New York City. It quickly won much fame. The current chef is Eric Ripert, also a Frenchman. He moved to New York City in 1991 and soon became the chef at Le Bernardin. On a beautiful Saturday evening, I entered Le Bernardin and felt immersed in Old World elegance, transported back in time to a more formal world. This is a place to impress with a subtly elegant decor. Men are required to wear jackets to dinner, though ties are optional. There was an ample staff in place and everything seemed to operate like a well-oiled machine. Their wine list is lengthy and impressive, though prices tend to be on the high side. They do have a lengthy list of Burgundy so that is where I concentrated my attention. There were several sommeliers on duty, all wearing a tastevin on a chain around their necks. A tastevin is a small cup that a sommelier uses to taste the wine. It is an old-fashioned but traditional touch that you see at few restaurants. I contemplated a couple different Burgundies and asked for some assistance from one of the sommeliers. I asked her if she could describe the basic style of the wines, and she was immediately able to do so. One was a more modern style wine while the other was more traditional. I decided on the more traditional one, the 2004 Domaine Robert Arnoux Vosne-Romanee ($135). We were very pleased with this wine. It was a very good example of a traditional Burgundy, especially after it breathed for a short bit. Plenty of good red fruit flavors with a touch of spice and earthiness. The tannins were smooth and the wine went well with much of our dinner. It is a wine that I would order again. For dinner, we ordered off the regular menu as we did not have time for an extended tasting menu as we were going to the theater that evening. The regular menu is a four-course meal for $109 per person. You get to choose each course from a list of about 10-12 items. Almost everything on the menu is seafood though they have a few other entrees. I thought that many of the available selections sounded quite delicious so it was difficult to decide what to select. I also thought a number of the selections were innovative, with intriguing combinations of ingredients. As our first course, we had Pounded Tuna with Foie Gras & Toast and Squash Blossoms filled with Peekytoe Crab and topped with Black Truffle Sauce. This tuna certainly took quite a beating as it was paper thin and covered much of the plate. Almost like a carpaccio. It was quite tasty, just melting in my mouth. The silky Foie paired well with the tuna. The crab-filled blossoms were also delicious, with plenty of sweet crab meat with a subtle sauce that only enhanced the flavor. Next up, a Sea Urchin Risotto with Toasted Nori & Urchin-Citrus Emulsion and Bacalao with Almonds and Chorizo Oil. The Risotto was exceptional, a creamy delight that I wanted never to end. Everything in this dish worked just perfectly together and it was my favorite dish of the evening. The Bacalao was very good too. It was clear that the chef well knew how to combine flavors and ingredients to bring out a harmonious melange of tastes. Nothing ever seemed out of place on our plates. Our entrees included a Surf & Turf of White Tuna and Kobe Beef with a lemon & brown butter emulsion and fresh kimchi as well as a Poached Halibut with marinated almonds, pistachios, green olives, and a blood orange-verjus vinaigrette. The tuna was tender and flaky and the Kobe, cooked rare, melted in my mouth. They were small pieces, which would not please some, but no one could complaint about their taste. The Halibut was a larger dish of food and had an excellent taste, with a nice blend of flavors from the nuts to the vinaigrette. For dessert, I selected a simple one, Coconut Sorbet. I received three scoops of a quite delectable sorbet with a strong coconut flavor, very smooth and pleasing. We also had the Chocolate-Sweet Potato, a Dark Amedai chocolate ganache, with sweet potato pearls, sorbet, pistachios, palm sugar, and vanilla salt. That was also a heavenly concoction, decadent and delicious. As a bonus, they also brought out a Passion Fruit Mousse dessert to me for birthday, with a candle in it. An excellent touch and the mousse was silky smooth with very good fruit flavors. The service was exceptional. All of the servers and assistants worked well as a team. They were all professional and made sure there were no problems. Overall, this was an exceptional dining experience, no less than what I expected. I would agree with all of the praise the restaurant has received over the years. It is well worth going to Le Bernardin, even if only for a special occasion. Burlesque is still hot and you will get a chance to catch a show at The Beehive in the South End. On August 5, from 9pm to 1am, the Beehive will present “Pinchbottom Burlesque. Pinchbottom is where burlesque meets theater, buys it a drink, and takes it to bed. Pinchbottom Burlesque is the name of a production company which produces themed & scripted burlesque shows in New York City. It is also the title under which its two creators, Nasty Canasta and Jonny Porkpie, perform as a duet. Each Pinchbottom show centers around a different theme, bringing together striptease and variety acts from top performers with contemporary narrative. It even has a plot and script! It will feature Nasty Canasta, Jonny Porkpie and Clams Casino, winner of the “2008 Burlesque Hall of Fame Exotic World Pageant” for “Most Humorous” and “Most Innovative.” You also don’t want to miss Peekaboo Pointe of “This is Burlesque” and the World Famous Pontani Sisters. This is a rare opportunity to see New York’s award-winning Pinchbottom Burlesque in Nasty Canasta’s hometown of Boston! Since she started performing, Pinchbottom’s producer Nasty Canasta has wanted to bring her unique brand of burlesque to Boston. Now, thanks to The Beehive she will have that chance, including a Red Sox tribute she first performed before the 2007 World Series. Do you remember the Belmont Breeze cocktail I posted about a couple months ago? It used Dry Sack, a Sherry which is a blend of Oloroso and Pedro Ximenez grapes and is aged for six years under the Solera system of blending. I have another new cocktail for you, also using Dry Sack. The Madroño, winner of the 2007 U.S. Sherry Cocktail Competition, is a twist on the traditional Sherry Cobbler cocktail. I had never heard of a Cobbler cocktail before but it is supposed to use a base spirit of wine, sugar, fresh fruit and ice. The original was the Sherry Cobbler, very popular in the second half of the nineteenth century. Mixologist Giuseppe Gonzalez, currently at The Clover Club in New York, created the Madroño using fresh strawberries and Dry Sack. "The cocktail was beautiful and balanced on its own merits. The strawberry, cinnamon, and demerara sugar combined with the Dry Sack created a delicious combination. This cobbler is an impressive nod to a classic cocktail. It was also a cocktail that was driven by Sherry, in that it was the principal ingredient. That wasn't a deciding factor at all, but it was nice to see Giuseppe utilize Sherry as the base for a cocktail and execute it perfectly," Andy Seymour, U.S. Sherry Ambassador. Muddle one strawberry in Torani Amer. Break cinnamon stick in half in cocktail shaker. Add Dry Sack. Shake. Serve in wine goblet or rocks glass. Add ice. 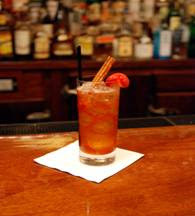 Garnish with fanned strawberry, cinnamon stick and a straw. Bin 26 Enoteca is one of those places that is on my short list of restaurants to check out. Though I have not been there yet, I have heard many positive recommendations for it. Bin 26 Enoteca has recently introduced two new lunch options, both quick and affordable. They have begun their Grab-n-Go Takeout Menu and Dine-In Express Lunch Service. Each week, there will be a new selection of market fresh pastas, salads, sandwiches, charcuterie and cheeses to choose from. Individual items will be available Grab-n-Go style for $8 or you can dine-in and enjoy an assortment of lunch items for $14. These lunches are available Monday through Thursday from 12:00-3:00 p.m.
My new column of "A Passionate Foodie" can be found in the July 23 issue issue of the Stoneham Sun newspaper. This is a weekly column that concentrates on reviews of local restaurants though it may also touch on a few other food and wine topics. The new column has been published today and is also available online. The new column discusses the upcoming Boston Restaurant Week. This is a two-week span in August where over 170 local restaurants offer 3 course meals at special prices, $20.08 for lunch and $33.08 for dinner. It is a less expensive way to dine out. Though the Wine Writers Workshop recently ended, it also spawned a new beginning, the creation of the Boston Wine Writers group. For some time, the idea for a local wine writers group has interested Jonathon Alsop of the Boston Wine School. And he has decided that now is the time to move forward with this idea, an idea I strongly support. For now, the Boston Wine Writers group will be rather informal, with meetings held about once a month. The basic idea is to give wine writers a place to meet each other, exchange ideas and contacts, discuss story ideas, critique each other's work and more. It is free to attend any of the meetings and everyone is welcome to come, not just wine writers. Jonathon states: "As long as you have a passion for good wine writing, it doesn't matter whether you're a published writer, editor, sales rep, importer, restaurateur, blogger, PR person, publisher, wine lover, whatever: you're invited!" He also suggests that if you wish to discuss one of your works in progress, that you should bring 20+ copies so that everyone will have a copy to read. Maybe in time there will be a message board or other online area where such works can be posted prior to the meetings so that people can read the articles before they get to the meeting. I would encourage all local bloggers to come join the Boston Writers group. I think it is a great idea that would benefit all of us. I would also encourage anyone who is interested in wine writing, but is just getting into it to join as well. I will definitely be at the first meeting so I hope to see many of you there as well. Jonathon Alsop at the Boston Wine School. Though Jonathon has run many different classes and events at the Boston Wine School, this was the first time he offered a Wine Writers Workshop and hopefully it will not be the last. Jonathon is a published wine writer so he knows about wine writing. I have been to another writing workshop before, though it had nothing to do with wine, so I had some idea what to expect. There were nine students, three men and six women, in the Workshop, though not all of them showed up for all four sessions. In fact, only three students were present for every session. To me, with only four sessions, I think you really miss out if you skip even one class. To gain the full benefit of the workshop, you should make every effort to attend all of the sessions. It was a diverse group of students, with different backgrounds in wine, which made for an interesting class. Fellow wine blogger Dale Cruse, of Drinks Are On Me, was one of those students and I finally got to meet him in person. With such diversity, you are generally assured of learning something new. During our first session, we spent time talking about ourselves, our backgrounds in wine and what we wanted to gain from the workshop. Jonathon also shared some of his background with us. Jonathon then began to discuss the field of wine writing and how best to pitch editors and publishers. An important idea is to give them options, to propose multiple ideas hoping that at least one of them will appeal to the editor or publisher. I think that can help as well show that you are a writer with much to say, that you are not there for a single article but have the potential for many more. This led to the Dream Sheet. A Dream Sheet is essentially a list of story ideas, ideas that you could pitch to others. You flesh out each idea to show the direction of the story as well as any technical details, such as sources, photographs and more. During the course of the Workshop, we would all create our own Dream Sheets and later discuss them with each other. In the end, you should have a Dream sheet of about twelve ideas. As home work after the first class, we also had to do a short essay on one of the elements of wine tasting, and that was critiqued during the second session. During that session, we also critiqued our initial Dream sheet drafts. This is the heart of a writing workshop, discussing and critiquing our writing samples, hopefully to improve them. In general, we had a good class who were very helpful in their critiques. Our assignment for session three, besides revising our Dream Sheets was to work on an actual wine article. We would continue to revise, discuss and critique the Dream Sheets and articles through session four. As in any writer's workshop, the benefit you receive is commensurate with how much effort you put into it. You needed to make time during the week to write, to have something to discuss in class. Otherwise, you would only be listening to critiques of everyone else's work, and not really working on your own. It is a commitment to partake in a writer's workshop. Jonathon was very helpful in his suggestions, and he shared much of what he knew about writing and publishing. In the final class for example, he provided us some contacts and sites that might benefit us. He was always encouraging and his criticisms were usually spot on. I do felt the class was helpful and I am very glad that I signed up for it. I only have a couple minor suggestions for future workshops. This workshop generally only dealt with print media, getting articles into magazines and newspapers. Though some of that is applicable to online publications as well, I would have liked to see more coverage given to online writing opportunities such as blogs and online publications. I also think the workshop could have been a little bit longer, at least one or two more sessions. That might have given sufficient time for everyone to end the class with a completed article that they could submit for publication. Maybe these matters will change in future workshops. This was only the first workshop so it was a learning experience for all, including Jonathon. Besides enhancing our writing, such workshops are also good networking opportunities where you can share your knowledge and contacts with other wine writers. I do hope to maintain contact with the other students in the class, to continue to help each other with our wine writing. As well all know, who you know can sometimes make a significant difference. If you are interested in wine writing, then keep an eye on the future schedule of the Boston Wine School and sign up the next time he offers the Wine Writing Workshop. He may also do a future Food Writing Workshop as well. They are definitely classes that will benefit you, provided you are willing to make the commitment to attend the classes and do your homework. A few years back, I visited True Saké in San Francisco, the first all-Saké store in the U.S. I was mesmerized by all of the varieties and brands of Saké available. But I was disappointed that it was located so far from me. I fervently wished that such a Saké store would open on the East Coast, to cater to my Saké cravings. In the Boston area, it can be difficult to find Saké and even the best stores might only have 20 available, if even that. Last December I was thus very excited to learn about Sakaya, a new all-Saké store opening in New York City. The more I read about it, the more I wanted to visit it. When I finally made it to New York City for a long weekend visit, I made sure that one of my destinations would be Sakaya. I did not have any Saké in my wine cellar so it was definitely time to restock. If you check out the photo above, you can see the front window of Sakaya, though the glare from the sun did not help the photo at all. If you look closely, you can see a green ball of vegetation hanging there. That is a sugidama, a globe of tightly bound sugi ("Japanese cedar"). Sugidama are traditionally hung in front of Saké breweries when the first batch of Saké is pressed each year as well as outside of Saké bars and stores. Sakaya is owned by Rick Smith, a former associate publisher at Food & Wine, and his wife, Hiroko Furukawa, and they bring a wealth of knowledge about Saké. They have studied under John Gauntner at his Professional Sake Course in Tokyo, visited Saké breweries, numerous izakaya, and Saké shops throughout Japan. The term "Sakaya" means a "Saké store" though more literally it can refer to any store that sells Saké. Here are a few statements from their website that help describe Sakaya. "Our credo is that saké is meant to be enjoyed and shared." "Our dream? To share our excitement about premium saké with kindred spirits like you." "Our aim is to offer a learning experience that not only creates an appreciation for and enjoyment of drinking saké, but also for the Japanese culture from which it originates." For more information about Rick, Hiroko and Sakaya, you should check out their Interview on the UrbanSake blog. The store itself is a small rectangle with the two long walls containing cedar plank shelves for the Saké. They currently stock about 100 different Sakés and Shochu/Awamori. The store is minimally decorated, a simplicity that reminds me of Japanese haiku. Haiku has such a simple structure but can possess such complex imagery and power. Each Saké bottle has a small card describing it and either Rick or Hiroko can tell you even more if you want. Upon my visit, only Hiroko was present so I missed the opportunity to meet Rick. Though I hope to meet him on a future visit to Sakaya. Below, you can see Hiroko at the register near the back of the store. The back of the store also has a refrigerated unit to keep some Saké chilled. I was quite impressed with the Saké selection, finding many I had not seen before in any Boston store. Sakaya stocks some more artisanal and rare Sakés. I easily bought a case, getting only one of any specific Saké as I wanted to try as many different ones as possible. I could have easily bought a couple more cases, just to try all of the ones I have never tasted before. Hiroko gave me some advice and suggestions on my selections which was very helpful. I don't have any real experience with Shochu, a Japanese distilled liquor. Supposedly, Shochu has become very popular in Japan, surpassing even that of Saké. So I have wanted to experiment, to try some Shochu and see what it is like. I asked Hiroko for a recommendation, an entry Shochu that was a bit milder and smoother. She recommend the Satsuma Hozan Imo Shochu so I bought a bottle and I can't wait to try it. Of course I will review of the Sakés and Shochu in the future. Though I was unable to attend one of their Saké tastings, Sakaya has frequent tastings and you can find a schedule on their website They can even ship Saké to some states, though sadly Massachusetts is not one of them. Plus, you should check out their blog. Sakaya is exactly what we needed on the East Coast, a Saké store with an incredible collection and run by two passionate individuals willing to share their love and knowledge of Saké with others. This is a place to go if you already love Saké and want to try different types and brands. It is also a place to go if you know little about Saké but are willing to learn and experiment. If I lived in NYC, I would be there every week. I strongly recommend Sakaya and I will certainly visit them again in September when I return to NYC. I am sure my Saké will be gone by then so I will be in need of a restock. On my last visit to Uburger, I tried a burger but it was also recommended, and I had seen other raves, that I should try their chicken sandwiches. So I decided to check out the chicken. Their chicken sandwiches contain a marinated grilled chicken breast and cost either $4.50 or $4.75. I ordered the Phat Chick, which has cheddar cheese, bacon and BBQ sauce. I have to say that it was an excellent sandwich and the recommendations were spot on. It was a moist piece of meat with a very nice flavor from the marinade. It was also a good-sized piece of chicken with plenty of real bacon atop it. For the price, this is a good and tasty value. I also tried their French Fries ($1.75) which are handmade. They were thin cut, piled high in their container, and tasted good, though I still prefer their onion rings. I think this restaurant definitely is doing well and I certainly would like to see more of them open in the local area. You had a ton of leeway for this tasting. You just find a wine with a word starting with the letter "S." That "S" word had to be directly related to the wine, such as its region, appellation, producer, varietal, style, winemaker, etc. There were over 40 participants, an excellent showing especially considering it is summer and many people may be away. Plenty of people got very inventive with their wine choices so it is well worth checking out the Round-Up to see which direction different people chose. I have had fun reading over the various reviews and enjoyed this theme. I hope you all enjoy the reviews too. After attending the theater (a funny production of Young Frankenstein), we decided to have a drink and a couple appetizers at Xai Xai, a new South African wine bar. I have read a bit about this place and wanted to check it out as I love South African wines, especially Pinotage. Xai Xai started as a idea between three Partners Tanya Hira, Brett Curtin and Dorian Gashi. They wanted to showcase South African wines, which are unfamiliar to many. They also wanted to provide an environment fitting to the wines. The Name "Xai Xai" is more of an indulgence for the owners. It refers to a small beach town in Mozambique. It is a small place, with a tiny bar and numerous small tables. There are several, ancient cypress logs that rise from the late flooring to the ceiling. It is modestly decorated, avoiding being kitschy. There are large windows in the front where you can watch the people passing by. We were lucky to get the last empty table, right next to the windows. It felt like an intimate place, very cozy. They have a very diverse selection of South African wines, including a fair share that I had never seen before. In general, they had about five wines of each type, mostly divided by grape. Not all of the wines were available by the glass, maybe closer to one-third. Prices did seem high based on the wines that I did know, over twice the usual retail. We tried a Pinot Noir that we had never tried before, though the name escapes me. They had the Hamilton Russel Pinot Noir on their list, which is one of my favorites, so I wanted to see how another producer would do with Pinot. It was a good wine, though nothing stellar, and certainly not competition for the Hamilton Russell. We also ordered the 2003 Stellar Winery Sensory Collection Pinotage, which is organic. Stellar Organic Winery, situated in Trawal, is the largest producer of fine organic wines in South Africa and their wine maker is Dudley Wilson. The Sensory Collection of wines are intended to showcase wines displaying particular character. I very much enjoyed this Pinotage, finding it to have good, dark fruit flavors and a spicy backbone with a touch of earthiness. I will be looking for this wine in my local area. Their food menu is basically all appetizers, including several South African dishes. We tried the "Mielie" corn fritters with melted cheddar cheese. These were small, pan-fried corn cakelets and they were very tasty, with a good, moist corn flavor and the cheese added a nice sharpness to the corn. I would definitely order them again. We also got the Meat Plate which consists of Biltong, garlic Droe Wors, salami and mixed olives. Biltong is a type of dried meat, almost like jerky, and it was fairly meaty with interesting spices. The Droe Wors was a small, thin sausage that also had excellent spices. The salami made for three tasty meats, which went well with the Pinotage. I would have liked to see some exotic meats on the menu, more game meats. That might have brought the menu for me closer to South Africa. Overall, I liked Xai Xai though the wine prices were a bit offputting. It is a place I would occasionally visit, though it would not become a regular hangout. Though it is still relatively new so things could always change. Two months ago, I read Passion on the Vine by Sergio Esposito. It is a compelling memoir about Italy, wine and food. Sergio clearly evidenced a deep passion for Italian wine and it motivated me to visit his wine store, Italian Wine Merchants, in New York City. I had to see the type of wine store that such a man would create. Sergio owns the store in conjunction with famed chefs Mario Batali and Joe Bastianich. Founded in 1999, the store sells only Italian wines and is dedicated to selling the best that Italy has to offer, especially from smaller boutique wineries as well as vintage wines from some of Italy's top producers. As you can see from the picture above, it is a rather unassuming store from the outside, though the shade in the window is usually raised. Yet the inside is more impressive. As you enter the store, to your left is a long wall with shelves of wine. You will immediately notice that there is only a single bottle of each type of wine. You cannot just grab a couple bottles of a wine off the shelves and take them to the register. You need to ask a salesperson to get the wines for you. This system does help conserve space as well as present a less cluttered look. I did purchase some wine and the process of obtaining the wines from their storage area was quick. In general, the wines are ordered by price point, from the lowest to highest. Red wines are also separated from white wines. Some of the least expensive wines were around $12 so this is not just a store for high-end wines. The Barolos are kept on a separate section of shelves and they and not ordered by price point but are rather collected together by producer. The shelves do not display of the wines they carry. Many of their oldest and most valuable wines are not kept on the shelves. If you are interested in such wines, you need to speak to my one of the staff. They have a cellar beneath the store that can hold about 200,000 bottles though it is not full. To the right of the entrance are some shelves of books, giftware, apertifs and other miscellaneous items. For example, you can find some grappa there. At the counter is a large display of antique corkscrews, all of which are available for sale. It is fascinating to look at those old cork screws, especially as they can be so diverse. There are some who might assume that the store is pretentious and snobby. But I believe that is far from the case. The staff appears helpful and pleasant and I felt the store had more of a homey ambiance. I spent some time speaking with Steve Iannacone, a Senior Portofolio Manager. He was very personable and accomodating. I observed some of the other staff as well as customers entered the store and they all seemed to try to make people feel welcome. Behind the main display room, there is a large area for functions, tastings, seminars and dinners. The above picture shows part of that room as it is being readied for a wine tasting. In the picture below, you can see the rest of the room. At the rear of the room is a salumeri where they make their own meats. The function room is impressive and I wish I could have attended one of their tastings but the timing was not right. As I scanned the display shelves, I found so many interesting Italian wines, including plenty that I had not seen before at any other wine store. I saw the names of producers I remembered reading in Passion on the Vine. It would have rather easy to buy a case or two but I was more limited this trip. In the end, I decided to buy a couple bottles of the 2004 Quintarelli Primofiore ($49.50). Sergio has nothing but praise for Giuseppe Quintarelli. He is not alone as many consider him an exceptional producer. He is also an absolute traditionalist. The Primofiore is his entry level wine and is made for drinking while it is young. I have never had any of his wines before so I wanted to start at the beginning. In time, if I enjoy the Primofiore, I will progress further through his portfolio. Italian Wine Merchants is also more than just a wine store. First, I recommend that you sign up for their weekly and monthly email newsletters as they are filled with information about Italian wine and its producers, as well as providing listings of upcoming events. Who can turn up free lessons on Italian wine? Second, they host numerous wine and food events, often having special wine tastings on Saturdays. You can even arrange for a private tasting. For the serious wine collector, you can work with one of their Portfolio Managers to help learn more about Italian wine as well as assist you in the development of your wine collection. They will customize a plan to meet your needs and interests. If you are truly passionate about Italian wine, this service could be quite valuable to you. I see Italian Wine Merchants as a place where Sergio is trying on instill his passion for Italian wines into his customers. It does not seem that he is seeking the casual patron, in to buy a cheap Chianti for a BBQ. It seems more that he is seeking converts, people who are willing to be amazed by the wines he has found. He understands the importance of education, to teach people about these wonderful wines. I am very pleased that I visited the store and I definitely will return again. I recommend that my readers stop by too. Take a chance and let yourself be seduced by the beauty of these fine Italian wines. Update (7/21): I wanted to add one more bit of info about the store that helps explain why there is only a single bottle on their shelves. I was informed that the main reason they only display a single bottle is temperature control, to protect the integrity of the wine. Their wines are generally stored in a temperature controlled cellar. They did not want to have their wines exposed to the variables of light and temperature. I was told: "All of our wines are alive and we really believe in delivering all bottles beautifully maintained, just as if they were produce." That certainly makes sense and shows a lot of care for their wines and the customer who will buy them. Next month is the 4th Anniversary of Wine Blogging Wednesday. That is certainly a significant milestone in the world of wine blogging. Lenn, of Lenndevours, is the creator of Wine Blogging Wednesday and he has chosen the theme for edition #48, the Anniversary special. The theme is "Back to Your Roots," a journey down memory lane to the wines that helped set us on our paths. So choose a wine from your early days with wine and taste it again and see how it fares the test of time. Or maybe you can select a wine that you used to drink a lot in your early days, but which you don't really drink now. For a fuller explanation, check out Lenn's post on the theme. For myself, I will probably select a wine that really sparked my interest in the beginning of my wine path. I have done the White Zinfandel and Riunite Lambrusco route. Yet those were not the wines that truly started me forward in the world of wine. I will spend some time pondering the matter, searching my memories to find just the right wine. On or before Wednesday, August 13, post your tasting notes on your blog, on the Wine Blogging Wednesday community site, or in the comments at Lenndevours. I think we will have lots of participation for this theme so it will be interesting to see all the wines that people select. For Saturday's breakfast, we returned to a familiar place, L’Express. L'Express is a Lyonnaise bouchon and its foods celebrate that region. It is homey type of restaurant, with a bar on one wall and many French themed decorations, such as posters, on the walls. They are open 24/7 so you can always stop by for a bite to eat. I come for their Croque Madame ($10.95), a large, grilled ham and cheese sandwich topped by two eggs over easy. The bread is obviously homemade and has a perfect crust and moist interior. The ham and cheese certainly seem of high quality and the ham was not fatty at all. The cheese was Swiss and had a superb taste. The eggs on top, when the yolks break and drizzle over the sandwich, completes an excellent sandwich. The sandwich is accompanied by some roasted red potatoes. Simple, but absolutely delicious. I have been here a few times in recent years and it has maintained consistent quality. Service was good. They have plenty of other items for breakfast, prices ranging from about $6-10. Very reasonable prices for a good breakfast. A spot I highly recommend. Last evening, local Bin Ends held their first Twitter Tasting. You can check out my prior post on the specifics of this innovative tasting. The special guest was Eric Solomon from European Cellars. European Cellars has been importing hand-crafted wines from France, Spain and Portugal since 1989. They're Spanish portfolio has been at the forefront of the influx of extremely high quality Spanish wines that having been making they're way to market over the past 10 years. I have tasted numerous wines from their portfolio and believe they have some very delicious and exciting wines. 2005 Burgans Bierzo "Cuatros Pasos"
Eric was joined by my friends and fellow bloggers, Ryan and Gabriella of Catavino. A number of other wine bloggers also joined in for the tasting. Eric basically spent ten minutes talking about each wine and fielding questions. I think we could have used a little more time with each wine, even if only five more minutes. The whole event ran very smoothly, especially considering this was the first event. Twitter also cooperated by not crashing as it is known to do far too frequently. Everyone participating seemed to have a very good time and the wines were excellent, especially for the price. Here are some more specific notes on all of the wines. Note that the prices provided are for Bin Ends, and are less expensive than the usual price for these wines. That means they are even more of a bargain. 2006 Pazo de Monterrey Monterrei ($14): This wine is from a D.O. in the Galicia region, the northwest corner of Spain. It is a small D.O. and this is the first wine I have ever had from that region. The wine is a blend of Godello and Treixadura. Eric stated: "ES: To me, this wine as I taste it reminds me of a hypothetical marriage of Sancerre, Hermitage blanc, and Chablis. Godello has good aging potential." I found this wine to have a pale yellow color with a citrus nose, especially some peach. It has a strong citrus taste with almost some grapefruit. It has a long finish and certainly would pair well with seafood. 2006 Rafael Palacios Louro do Bolo Godello ($16): From the Valdeorras D.O., this wine is 100% Godello without any oak. Eric had much to say about this wine. "Here is an example of how a white wine from a single variety can be so complex, like Riesling, like white Burgundy." "In a portfolio of over 500 wines, it's tough to have favorites, however, may be the greatest white wine for the money in my book!" "My personal belief is that Godello will emerge as Spain's most serious white wine variety, achieving cult status." I found this wine to have a golden yellow color and to be very aromatic. You could simply sniff this wine and revel in its melange of enticing aromas. On the palate, there too is a melange of tastes, lots of citrus with bits of spice and even honey. It definitely is a complex and appealing wine. 2007 Pazo de Senorans Albarino ($23): From the Rias Baixas D.O., this wine is made form 100% Albarino. The wines comes from the oldest, lowest producing vines in the region. I have had this wine before, though not this particular vintage, and I have been a big fan. I even chose this wine for a Spanish Tapas wine dinner held at a local restaurant. This is an excellent wine with an enticing nose and a nice crisp taste of green apple and peach with a bit of minerality. Out of the three whites, this was my favorite, though I very much enjoyed the other two as well. 005 Burgans Bierzo “Cuatros Pasos” ($12), From the Bierzo D.O., this wine is made from 100% Mencia. This is the first vintage of this wine, made from 8o year old vines and aged for 3 months in French and American oak. Eric stated: "Think of this as Barbera meets Cab Franc." I enjoy wines made from the Mencia grape but initially I did not care for this wine as I felt it was a bit tannic and rough. But, after the wine sat for a time, it mellowed out and I began to enjoy it. The wine is very dark red in color, almost purple. It has an alluring nose of ripe plum and blackberries that also comes out on the palate. The tannins smoothed out and it became more like the Mencia I like. Just make sure to let it breathe a bit after opening a bottle. 2005 Bodegas Mustiguillo “Mestizajes” ($15): This wine is from the Utiel-Requena D.O., another less common region. It is composed of 70% Bobal and equal parts Tempranillo, Garnacha and Cabernet Sauvignon. The grapes come from vines planted on chalk and limestone at high altitude. Malolactic fermentation occurred in used French oak where the wine remained for 6 more months before being bottled unfined and unfiltered. This wine really impressed me! It is dark purple in color with a subdued nose but a bold taste of ripe plum, blueberry and black cherry. It is full-bodied and chewy and there is plenty of complexity, especially at this price point. A vey satisfying finish and I made sure to drink more of this after the tasting. This was my favorite of the reds! 2005 Castano Tecla “Solanero” ($14): From the Yecla D.O., this wine is made of 65% very old Monastrell, 20% Cabernet Sauvignon and 15% Tintorera. It was aged in French oak. Another dark red, almost purple colored wine with an intriguing nose of spice and dark red fruit. On the palate, there is lush fruit flavors with some clove/cinnamon notes. Those spices are not usual to Monastrell but derive from the Tintorera. A smooth, easy drinking wine that would make an excellent BBQ wine. Overall, these wines and excellent values, especially at their discounted prices form Bin Ends. And the Twitter Tasting itself was lots of fun. It was interesting to get live tasting reviews from people all over the world. I look forward to their next Twitter Tasting and hope even more people join in. The next Twitter Tasting is scheduled for August 21st. Etienne Hugel, from Hugel et Fils in Alsace will be joining Twitter live from Alsace! In recent years, there is only one Japanese restaurant that I want to dine at when I go to New York City. Though there are plenty of other options, I know that I will have a phenomenal meal, that the service will be excellent, and there will be some delicious Saké. Why change any of that? Thus, when I made plans for my recent visit to NYC, I knew that I had to book a reservation at Megu. There are two locations of Megu in the city, though I have only been to their original location in Tribeca at 62 Thomas Street. Koji Imai, who has over thirty restaurants around the world, opened Megu in 2004. Now why doesn't he open one in Boston? The restaurant has a lounge upstairs and the dining area itself is downstairs, though you can order some food in the lounge. The lounge is plain but comfortable with a rectangular bar in the center which is surrounded by tables, chairs and booths. Before dinner, we stopped here for a drink. My wife had a "Megu Mule," a cocktail that includes shochu. (As I did not have my notebook with me, I have to rely on my memory so I don't have all the details of everything, including the other ingredients in this drink). It seemed mild with intriguing fruit flavors but I think it had a kick that you would not notice until later. So be careful of how many Mules you drink. I ordered a small bottle of Saké but they were out of the brand I requested. Our server recommended another, the Kaetsu Saké, and I decided to try it. I was pleased that the server had not tried to upsell me. In fact, the Kaetsu was even less expensive, by almost $10, than the Saké I had originally ordered. I very much enjoyed the smooth flavor of the Kaetsu. After finishing our drinks, we walked down to the dining area. As you enter the dining area you are greeted with a loud cheer of "Irrashimase," a Japanese word that means "welcome." It is a large restaurant and has a long sushi bar as well. The restaurant is stunning with an elegant Asian ambiance. There is a huge ice sculpture of Buddha, which is carved anew each day, as well as a large, engraved temple bell. It is very tastefully decorated and there is nothing hokey here. Once seated, I began my exploration of their Saké menu, a multipage book with many different choices. After speaking with their Saké sommelier, I decided on the Maimon B Saké ($88), a Junmai Ginjo that is made exclusively for Megu. This was an excellent Saké, mellow with intriguing fruit flavors and a long finish. We actually ordered a second bottle later in the evening. Though I considered ordering a different Saké, just to try something else, we enjoyed this too much so had to get another one. On my previous visits to Megu, I have ordered their tasting menus or omakase. Those were definitely very good choices, especially if you have never been to Megu before. You get a diverse selection of dishes and can taste a full range of what they have to offer. Be prepared for a lengthy meal as they do not rush you and you will have numerous courses. You won't want to rush the experience anyways. Just sit back and enjoy all of the delicious food. On this visit, I decided to order off the menu, to create my own tasting menu. The menu is quite extensive and can seem intimidating at first. That is why a tasting menu or omakase may be your best option. I ordered a few items at a time, to space out the dinner and better gauge when we were full. We were not in any hurry and our server did not try to hurry us. We were there to savor some exceptional food and time was not an issue. We began with Foie Gras Croquettes that contain Kobe beef. These golf-ball sized croquettes were perfectly crisp on the outside with a moist, silky interior. Foie gras and Kobe beef, you don't get two more mouth watering tastes. The Shrimp Cocktail had huge, fresh shrimp with a deightfully spicy cocktail sauce called Kanzuri. Kanzuri is a unque sauce of red chili peppers fermented in snow. The Shrimp Tempura, with some veggie tempura as well, was perfectly crisp and light. Long pieces of shrimp with a slightly sweet taste. Just perfect tempura. The Tatsuta Chicken, small pieces of fried chicken in a light ginger batter, were moist and flavorful. Megu has a grill where they cook numerous different skewers, from beef to seafood. I selected several skewers, including the Kobe filet with Gorgonzola, the Silver Cod, the Ayu Sweet Fish and the Unagi. All of the skewers were delicious, whether the tender Kobe with the bit of the Gorgonzola or the sweet cod. The Ayu was the most unusual as it was a whole fish, formed into a "S" shape as if it were swimming. Such a cool visual. You just dug into the fish, extracting the bones and enjoying its sweet flesh. Presentation is very important in Megu and the dishes are usually very aestethically pleasing. Next up was the Kagero Kobe beef skirt steak on a hot stone. Several slices of tender beef that actually cook upon the hot, black stone. The beef simply melts in your mouth and you actually get a good portion of meat. They have a few different cuts of Kobe that you can get on the hot stones and it is a dish I highly recommend. With this, we also had some Garlic Miso Toast. These small pieces of fresh, toasted bread were smeared with garlic/miso paste and were sweet with plenty of garlic flavor. These were so good, and seemed simple to make, so I am going to try to make these at home. We finished our dinner with some sushi, which is a must order. They have incredibly fresh fish and they serve good-sized pieces. They also have real wasabi root that they grate upon your sushi. None of that fake wasabai paste here. Real wasabi is actually not that hot at all. We ordered the maguro akami (tuna), unagi (eel), maguro oh toro (fatty tuna), seared chu toro (medium fatty tuna), and a crunchy unagi garlic roll. All of it was excellent and I probably could have eaten much more. It is just so hard to resist. For dessert, we split the Matcha Green Tea Crepe, with Matcha Rikyu Sauce and filled with a creamy matcha custard. This is actually a very light dessert so easy to eat after such a feast. It also is quite delicious with an intriguing green tea flavor. Overall, the food was superb without a single complaint or misstep. There is no dish that I had that I would not recommend. Wonderful presentations with great blends of flavors. Service was exceptional, as usual. They are very accomodating, personable and attentive. The service and ambiance helps make Megu a top notch dining experience. As for the prices, Megu is expensive though their prices are certainly comparable to other high-end Japanese restaurants. As you receive an exceptional meal, I wholeheartedly feel it is worth the price. I never feel that I do not get my money's worth when I dine here. If you enjoy Japanese food, then you definitely should check out Megu, even if only for a special occasion. I am positive that I will dine there again when I return to New York City. Megu receives my highest recommendation! Cathy Huyghe of 365 Days of Wine is a local wine blogger and writer and if you have not checked out her blog, then you should. It is filled with interesting information about wine, especially concerning the Boston area. You might also want to sign up for her weekly newsletter to keep updated. One intriguing element of her blog are the Twenty Questions, a series of interviews with people involved in the world of food and wine. She has interviewed people such as Diane Manahan (the owner of Pamplemousse in Salem), Richard Elia (Publisher of Quarterly Review of Wines), John Hafferty (managing partner of Bin Ends in Braintree), and Michael Meagher (sommelier at Sel De La Terre in Boston). This week, I am the subject of her Twenty Questions so please go read my interview and learn more about me. You will learn about my background, my past experiences as well as my objectives for my own food/wine blog. I hope you enjoy. When I visit New York City, I always make an effort to visit a few of their excellent wine stores, including at least one that is new to me. Last year, I visited Astor Wine & Spirits for the first time. In this trip, I chose to visit it again as I think it is one of the better wine stores in the city. Their store is quite large and they have a very diverse selection of wines, from all over the world. They even have a large collection of Japanese Sake, much chilled in a refrigerated area. They have plenty of excellent, inexpensive wines as well as much more expensive, cult wines. They also run free tastings about four nights a week. You should sign up for their email newsletter to stay current on all of their events. I did not purchase much this trip, only because I would be visiting two other wine stores this weekend. And I had never been to either of those two stores. I did though get a bottle of 2006 Sea Smoke Southing, a very difficult wine to find. I have had the 2005 vintage and really loved it so I look forward to trying the 2006. I also found a Greek Rose, a wine I had not seen anywhere else. I love both Greek wines and Roses so hope this is a good one. I bought a bottle of Ty Ku, an intriguing Saké liquer that I recently tasted while I was in Las Vegas. If you are in New York City, this is one wine store that you definitely should check out. 399 Lafayette St at East 4th St. While wandering near Central Park in New York City, I make the effort to stop by the Time Warner Center. The Center is home to numerous shops and restaurants, including the renowned Per Se and Masa restaurants. Reservations to both of those places are difficult to obtain but I stop by the Center for another reason. I want to taste the pastries and baked goods of Bouchon Bakery. Owned by the Thomas Keller Restaurant Group, there are three Bouchon Bakeries in the U.S., in Yountville (California), Las Vegas and New York City. The Bakery makes a wide assortment of items, including breads, cookies, muffins, pastries, quiche, salads and sandwiches. It is not cheap but the food is very high quality and quite delicious. Their muffins really show to me their baking skill. They usually only have a few flavors of muffin available but they are all moist and flavorful. Their banana nut is excellent as well as their corn muffin. Now, on one of my last trips here, I bought a corn muffin. But I did not eat it until later the next day, on the ride home. Yet the muffin was as fresh and moist as if it was just baked. And that almost never seems to happen with other corn muffins. They usually are very dry the next day. This bakery is very popular and I know why. I highly recommend you stop by and treat yourself to a pastry or muffin. Why not stop by the Beija Patio Bar party at The Foundation Lounge in Kenmore Square on Friday, July 18. There will be a VIP Reception from 9-10pm when Beija will pick up your first cocktail. Just RSVP to vip@beija.net. The Patio then opens at 10pm with Special Caipirinhas and Mojitos all night. This is an open invite event, no guest list, no cover. We arrived in New York City early on a Friday morning, figuring we might not be able to check into our hotel yet. I already knew that Les Halles was near the hotel and thought we could get breakfast there. I had not been there before but I was cognizant that the famed Anthony Bourdain used to work there as a chef. Lucky for us, we were able to immediately check into our hotel. So, after a quick unpacking our of luggage, we went off to breakfast. "Les Halles is a typical Parisian Brasserie bustling and lively serving the fresh and simple dishes of France's everyday cuisine, in a relaxed environment. Brasserie Les Halles has long been known for informal French fare in a warm and convivial setting. Les Halles evokes the atmosphere of the brasseries in the old market district of Paris, where the cream of society, stopping for a bite after a night on the town, would sit next to workmen having their breakfasts, truckers finishing their shifts or artists drafting creatively." I found Les Halles to be a nice, casual bistro with an outside patio. It is a medium-sized restaurant with a bar and plenty of small tables. It was not too busy this Friday morning though the patio area was almost full. We chose to sit inside, to get out of the rising temperatures. The menu is split between Parisien and New Yorker selections. The Parisien selections are more breads and pastries, as well as French toast and crepes. The New Yorker choices are mostly heartier dishes, many with eggs. Prices are generally reasonable (especially considering NYC prices) such as $2 for a croissant, 43 for an apple turnover, and $7.50 for Brioche French toast. We chose the Duex Oeufs a Votre Facon ($8.50) which consists of 2 eggs with Les Halles home fries, toast, and choice of bacon, sausage or ham and the Omelette Savoyarde ($12.50), a Gruyère cheese omelette with Les Halles home fries and toast. Both were very good breakfasts. The home fries are tiny squares of fried potatoes with a few onions. The toast were slices of French baguette, with a crusty exterior and light, fluffy interior. The omelette was loaded with creamy and flavorful cheese. The bacon was thick and crispy, just the way I enjoy it. Their French Press coffee was also very good. Service was good and we had no complaints. I would return here for breakfast and would like to check it out for dinner as well. This was a good way to begin my weekend in NYC. Think Pink for the Summer! I love Rosé wines and have reviewed a number of them in recent weeks. So when I had the opportunity to attend a tasting class on Rosé wines, including a few less common ones, I was eager to go. The class was led by Jonathon Alsop at his Boston Wine School. His website states: "Jonathon Alsop is a wine writer covering wine, food and travel since 1988. He is author of the wine column "In Vino Veritas" as well as many articles for the Associated Press, Frequent Flyer, La Vie Claire, Beverage Business Magazine, Mobil Travel Guides, Fodor's Travel Guides, Boston Globe, and others. In addition to writing about wine, Jonathon founded the Boston Wine School in 2000 where he teaches wine and food classes." This is the second class I have attended at the Boston Wine School, the first being a Wine Writer's course that is still going on (and which I will review later). But the Rosé class was the first tasting course I have taken there. The usual price of these tasting classes is about $50 though the Rosé class was only $35 as the wines are less expensive. I have found Jonathon to be personable, knowledgeable and very down to earth. He is definitely not some pretentious wine snob. He wants the students to feel comfortable, to trust their own palates, and I think he accomplishes exactly that. There were fourteen people in the class and everyone seemed to enjoy themselves very much, opening up more as the evening progressed. Jonathon helped to make the class fun as well as informative. The Boston Wine School is a good venue for classes and even has a kitchen area. The tables and chairs are generally set so everyone can more easily see each other as well as converse. It is an intimate setting, perfect for small groups. Before the class began, Jonathon handed out flute glasses of a German sparkling water, Gerolsteiner Mineral Water, and there was a plate of fresh cantaloupe and strawberries. All intended to help us relax as many were coming directly from work. I thought the water was delicious, with a light and natural effervescence. It is something I am going to seek out as I am usually not a big fan of carbonated waters. In additions to the wines, Jonathon provided an assortment of foods to nibble on, including figs, three different cheeses, some cured meats, bread, olives and pickles. This was a very nice touch and all of the food was fresh and tasty, especially the cheeses which included a Brie and a Gorgonzola. We tasted twelve Rosé wines, sequenced from the lightest color to the darkest. Nearly all of these wines cost less than $20 making Rosé a good value. 2006 Dr. Loosen Villa Wolf Rosé de Pinot Noir (Pfalz, Germany): This wine had a very pale color with almost an orange tint to it. It had a subdued aroma with maybe a touch of red fruit. It was a dry wine with some strawberry flavor and a bit of tartness. It was also acidic and only had an alcohol content of 11%. It was ok but nothing special and probably something I would not buy. 2007 Domaines Corey Creek Rosé (North Fork, Long Island): This Rosé is a blend of Merlot, Cabernet Sauvignon and Cabernet Franc. I did not care for the smell as it seemed to have some vegetal notes, maybe from the Cabernet Franc. I also did not care for the taste as I still got green notes and some light effervescence. 2007 Charles Shaw White Zinfandel (Sonoma): Yes, technically White Zinfandel is a Rosé. And I must admit there was a time when I enjoyed White Zinfandel. But the more I have gotten into wine, the less sweet wine I usually want, except for dessert wines. This wine had a sweet strawberry aroma and tasted like strawberry jam or even cotton candy. It only has an alcohol content of 11%. It is still a popular wine but I am no longer a fan, preferring my Rosé to be dry. 2006 Bogle Petite Sirah Rosé (Clarksburg, CA): With a nice pink color, the nose seemed a bit closed as I could not really smell much there. It was a very dry wine with a restrained flavor of strawberry and raspeberry. Its finish was very short, the flavor vanishing very quickly in your mouth. Another Rosé that did not appeal to me. 2007 Louis Jadot Beaujolais Rosé (Beaujolais, Burgundy): I have never had a Beaujolais Rosé before so I was very curious about this wine. It is made from the Gamay grape and has an alcohol content of 12%. It had a pleasant nose of strawberry which followed through on the palate as well, mixed with hints of light cherry. It is a medium bodied wine and almost seems sweet because of the lush fruit but it is not. I found this a very pelasant wine and would recommend it. 2004 Long Beach Shiraz Rosé (Robertson, South Africa): Another Rosé to intrigue me because of its country of origin. I have had only a couple Rosés from South Africa and usually have enjoyed them. This wine was a darker pink color with a more unusual but interesting nose, a bit of apricot and almost tropical fruit. Possibly due to the fact it is older than most other Rosés on the market. Its taste was just as intriguing to me, with touches of apricot but a little strawberry as well. There was also a hint of smokiness that seemed to come and go. A very different Rosé but which is enjoyable. Another wine I would recommend. 2005 Marea Rosato del Salento (Puglia, Italy): This was another older Rosé but it did not fare as well. It was a bit orangey in color with an offputting, medicine smell. It tasted sour with apricot notes and I did not like it. 2007 Kim Crawford Gisborne Rosé (Gisborne, New Zealand): We now moved on to a biigger, bolder Rosé with a vibrant strawberry nose. It was a more full bodied wine with an alcohol content of 14%, though the alcohol was balanced. It is a dry wine with lush fred fruit flavors and would definitely be enjoyable on a summer day. 2005 Galil Mountain Rosé (Galilee, Israel): This was another wine that really intrigued me as I have had very few wines from Israel. This Rosé is a blend of 65% Sangiovese, 23% Cabernet Sauvignon and 13% Syrah. I certainly had no idea they grew Sangiovese in Israel. It had a vibrant dark pink color with an enticing nose of mixed red fruits. It was a full-bodied wine with an intriguing taste of strawberry, raspberry and a touch of watermelon. It was slightly tart and had a nice, long finish. I thought it was a very good Rosé and I would recommend this as well. 2007 Marques de Caceres Rosado (Rioja, Spain): I have had this Rosé before and enjoyed it at the tasting as much as I have before. It is a Tempranillo blend and just the image of a good, down-to-earth Rosé, with excellent fruit flavors, dry and a nice crispness. Another wine to buy and share with friends. 2006 Domaine de la Mordoree Tavel (Rhone Valley, France): This Rosé was the star of the show and the most popular for many of the attendees. This is what you might think of as a more serious Rosé, a subtle and complex wine. It is a dark pink color and has a nose of strawberries and cream. On the palate, you get an assortment of red fruits with hints of spice. It has a satisfying, long finish and may be the heavy weight with an alcohol content of 14.5%. This wine shows that not all Rosés are simple wines. I highly recommend this wine! 2007 Saintsbury Vin Gris of Pinot Noir (Carneros, CA): We ended on a poor note, the darkest wine of the bunch. I recently tasted this wine at home and found it unbalanced, the alcohol too prevalent and masking the rest of the wine. At this tasting, I was once again disappointed, the wine unbalanced and bitter. What makes it more disappointing for me is that I like most of the other Saintsbury wines. They make excellent Pinot Noir so I wanted to like this wine too, but I just can't. This was an excellent tasting class and motivates me to sign up for other classes at the Boston Wine School with Jonathon. Jonathon provides a fun environment to learn about wines without pretension or snobbery. I highly recommend you check out the list of upcoming classes and sign up for something interesting. You won't be disappointed. I Want Wine Shipped To Me!